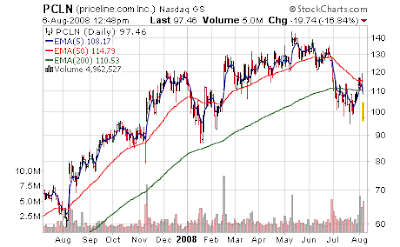 Fund My Mutual Fund: Priceline (PCLN) - Down 17% on Good Earnings? Priceline (PCLN) - Down 17% on Good Earnings? They just continue to hit home run after home run. (Booooyah (tm)! beat by $0.16) My thinking has been as the pooring of America continues, Priceline has a bit of unique niche with their model and could sort of be the Walmart of travel booking... they sure seem to be feeling no ill effects from the economy, so this may be what is happening. What a paradox this market is. If I still cared about (ahem) fundamentals I'd see a company that beat estimates, raised full year guidance, and now trades at 18x forward 08 earnings. Heck, it even deals with the booming airline and hotel industries - sectors sure to rip higher as the economy revvs up. (cough) Instead the stock is down 17% due to all the same factors ripping into every other "growth" story - there "might" be a slowdown in future growth. Yes, I get that - but I am simply amazed this pattern is repeating everywhere - companies which "might" slow from 40% growth to 30% are pummeled while people run to companies that are in the 7% growth area - especially when the 7% growers have the same P/E ratio. Ah... HAL 9000 strikes again. As another aside, why any selloff at all? Now that crude is heading back to $60 - that should help the US consumer (and world consumer) and the same theories buoying other stocks (anti-oil trade) should help Priceline as well, right? Consumer will have more discretionary income and after buying autos, and new shoes at every major retailer will be traveling like mad (staycations? So spring 2008) See what I mean - this is called "selective reasoning" - we can run up stocks A, B, and C for theory X but stocks D, E, and F which would benefit from theory X as well - well we are selling those. ;) The difference? It's random. But you still have to figure it out in advance or lose 1/5th of your capital in position overnight. Online travel agency Priceline.com (PCLN) on Tuesday posted higher second-quarter net income, but shares fell about 15 percent after the company warned of potential troubles related to the economy and airline capacity cuts. The company said its second-quarter net income rose to $54.1 million, or $1.08 per share, from $34.6 million, or 79 cents per share in the year ago period. Excluding one-time items, Priceline earned $1.55 per share, topping forecasts for $1.11 per share, according to Reuters Estimates. The company said its bookings amounted to $2.1 billion billion, a 71 percent increase over the year-ago period. Bookings on Priceline's international operations increased 80 percent, while domestic bookings increased 59 percent. Priceline's revenue rose 44 percent to $514 million. "The things that are propelling the business are that we had a very significant increase in airline ticket sales tied to our no-fee initiative and what we think is pretty effective marketing," Boyd told Reuters. Boyd was referring to its elimination of bookings fees on the purchase of airline tickets. For 2008, Priceline said that it expects to generate about $7.55 billion to $7.9 billion in gross travel bookings. That forecast is consistent with previous guidance. The Norwalk, Conn.-based company boosted its full-year earnings outlook to between $5.50 to $5.85 per share, from its previous guidance range of $5.25 to $5.65 per share. Analysts expect 2008 earnings of $5.54 per share. For the third quarter, the company predicted a 44 percent to 65 percent increase in gross bookings from the year ago period. The company said it sees its third quarter revenue increasing 30 percent to 35 percent year-over-year. But enough about those silly numbers. It's all about the chart, and if we look we see stock bottomed around $95 in mid July which is near to where the stock fell to at its nadir today. Below that is some minor support in the mid/upper $80s. If that breaks? I see a gap there in the mid $60s in August 2007. Might be another test of the "gap" theory. (most gaps in charts get filled) Simply too dangerous to apply capital unless you are a flipper who goes in, with a stop loss around $94 and try to flip for a quick dead cat bounce type of gain. Since that is not us, we won't do that here but just saying it. Buy and hold? Haha you jest. If it breaks upper $80s in fact, it would look to be quite a nice short. We can't do that either but just saying it. Would valuation dictate such a dramatic move down? No. But valuation means nothing. Remember, in this market you want to buy the airlines who lose money on every flight - not the booking agent who makes money but might be in danger of making more money next year (albeit at a slower place than this year). Making more money next year is bad if its at a slower pace than this year; losing money next year is good if its a slower pace than this year. HAL 9000 says so. We must obey or lose our capital. On the plus side this opens up our choices of stocks to buy by a huge amount - there are countless companies losing money hand over fist. Now just to figure out which the computers love the most. As for Priceline.com? Hopefully the resurgent economy of US 2009 brings back the rest of the world by say 2018. Then it's a buy.